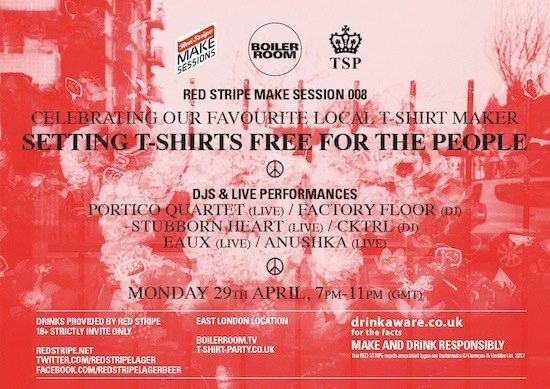 We are looking forward to the eighth Boiler Room Make Session, which will see lager beer brand Red Stripe team up with innovative T-shirt company – T-Shirt Party, for a one off night on 29th April at the world’s number one underground music show: Boiler Room. For those of you lucky enjoy to get on the guest list for this party, Make Session 008 will showcase some of the biggest names in the underground fashion and music scene. Whilst Portico Quartet, Stubborn Heart, Factory Floor, Anushka, Eaux and CKTRL play the freshest, forward thinking beats and bangers, T-Shirt Party will present their simple and creative tees in a t-shirt exhibition. 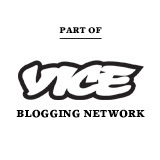 This taps into the creative ethos built into the core of Boiler Room and Red Stripe, with T-Shirt Party bringing their authentic street wear to the mix. 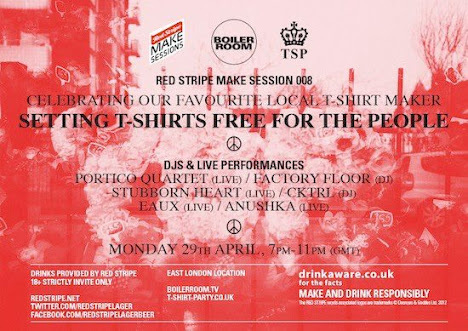 Everyone attending the event will be given their very own t-shirt artwork created by T-Shirt Party in collaboration with Red Stripe and Boiler Room.